A series of terrorist bombings and attempts in New York City and New Jersey this weekend is placing federal law enforcement and terrorist task forces on high alert. Early Monday morning, the FBI identified a person of interest wanted in the latest in a series of terrorist related bombing attempts. 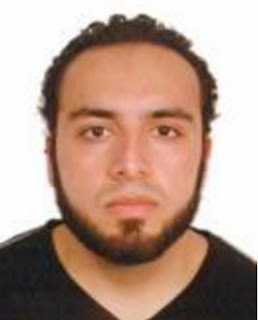 With the morning rush hour, an emergency alert was issued by authorities for a suspect: Ahmad Khan Rahami, 28 of Elizabeth, NJ. The suspect is considered armed and dangerous. Overnight the Elizabeth mayor Christian Bollwage confirmed the FBI was on the scene of that New Jersey town late Sunday night engaging in what's described as five pipe bombs similar to the bomb that exploded on Saturday night on 23rd Street in Manhattan. One of the five pipe bombs in Elizabeth exploded when a robot was engaged to disarm it. More than two dozen people were reported injured in the Saturday night Chelsea blast, none seriously as a dumpster was rocketed across the street in the explosion. Additional reports last night claim five people were in custody after being pulled over on the Belt Parkway reportedly armed. Those details await further confirmation. Governor Chris Christie on Sunday declared the explosion of a bomb on the route of a Marine Corps 5K charity run in Seaside an act of terror as other officials were silent to the assessment on what was described Saturday evening by NYC mayor Bill de Blasio as an "intentional" act in Chelsea. President Obama was in New York City for a fundraiser this weekend but has made no comment on the terrorism incidents. Related: The Minnesota man alleged to have stabbed eight people in a St. Cloud, Minnesota mall Saturday night in what the FBI described as a "potential act of terrorism" has been identified as Dahir A. Adnan. The 22 year old man, an immigrant of Somalia was shot and killed by an off duty police officer.